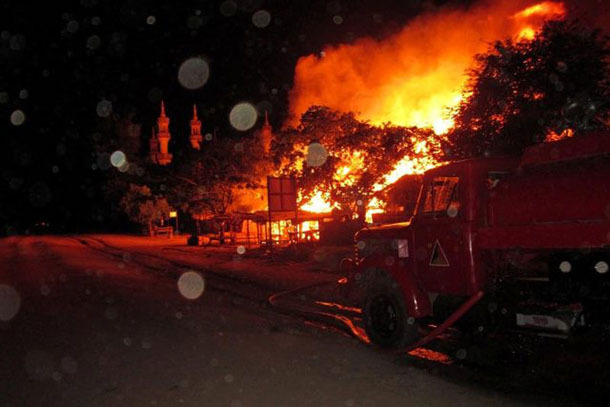 HTAN GONE, Sagaing Division — Members of a 1,000-strong Buddhist mob torched dozens of homes and shops in northwestern Burma following rumors that a Muslim man tried to sexually assault a young woman, officials and witnesses said, as the country was once again gripped by sectarian violence. The rioters, who sang the country’s national anthem as they rampaged, dispersed after security forces arrived early Sunday, shooting into the air. No injuries were reported. The hours-long riot in Htan Gone village, located 16 kilometers (10 miles) south of the town of Kantbalu in the division of Sagaing, began late Saturday after a crowd surrounded a police station, demanding that the suspect in the attempted assault be handed over, a police officer told The Associated Press. The officer requested anonymity because he did not have the authority to speak to reporters. State television reported that about 42 houses and 15 shops were burned and destroyed—most belonging to Muslims. The predominantly Buddhist nation of 60 million has been grappling with sectarian violence since the country’s military rulers handed over power to a nominally civilian government in 2011. The unrest—which has killed more than 250 people and left 140,000 others displaced—began last year in the western state of Arakan, where nationalist Buddhists accuse the Rohingya Muslim community of illegally entering the country and encroaching on their land. The violence, on a smaller scale but still deadly, spread earlier this year to other parts of the country, fueling deep-seeded prejudices against the Islamic minority and threatening Burma’s fragile transition to democracy. Almost all of the victims have been Muslims, often attacked as security forces stood by. The Information Ministry said that at the height of the latest round of violence, up to 1,000 people were rampaging through Htan Gone village. The riots were triggered by a report that a Muslim man attempted to sexually assault a Buddhist woman on her way home from work, the ministry said. The man was brought to the village police station and transferred to Shwe Bo Prison. He said police officers who attempted to disperse the mob were attacked, prompting the officers to fire into the air. “After they [rioters] destroyed the Muslims’ shops, they torched a poultry farm, a tea shop and other shops. When they headed to another house to torch it, the police urged them to stop but they threw stones and attacked with slingshots, so the police opened fire into the air,” he said. “Fire engines could not extinguish the fires at first. When the mob started torching the houses, they blocked the way and attacked the fire engines. Aung San, a 48-year-old Muslim man, said his family had to flee when the mob burned down their house. He lives with his parents, who are in their 70s. He and his family were taking refuge Sunday at a Muslim school. The police told The Irrawaddy that 11 men had been detained for allegedly torching the homes and shops, and that an investigation was ongoing. State-run media offered a timeline of the events. At 7:30 pm, the crowd gathered at the local police station and called on officers to hand over the suspect, according to the Rangoon-based New Light of Myanmar newspaper. After the crowd began setting fire to shops and homes, the township police commander and other officials arrived at about 8 pm and attempted to control the station. At about 10:30 pm, as rioters continued setting shops alight, the region security and border affairs minister arrived, along with the district police commander. The first warning shot was fired to disperse rioters at about 1:15 am, the newspaper said, and a second warning shot was fired later to clear a path for fire trucks to put out the fires. A police battalion arrived at 3 am to assist 70 firefighters, who managed to control the fires by about 3:30 am, it reported. A total of 44 houses, nine stalls and four shops were destroyed, the newspaper reported. It said one firefighter and one civilian were injured in the incident. The New Light of Myanmar said the region chief minister later formed a committee with local authorities to meet with residents and religious associations, in a bid to deter further violence. The minister made arrangements to open relief camps for the fire victims, the newspaper reported, adding that relief items were being distributed to 50 households. Myint Naing, an opposition lawmaker who represents constituents in Kantbalu, was outraged by the latest violence. He said Muslims and Buddhists have lived side-by-side in the area for many years. “There is a mosque in almost every village in our township and we live a peaceful co-existence,” he said, adding that at least one mosque was burned down in the violence. “I cannot understand why the authorities were unable to control the crowd when it originally started,” he said.